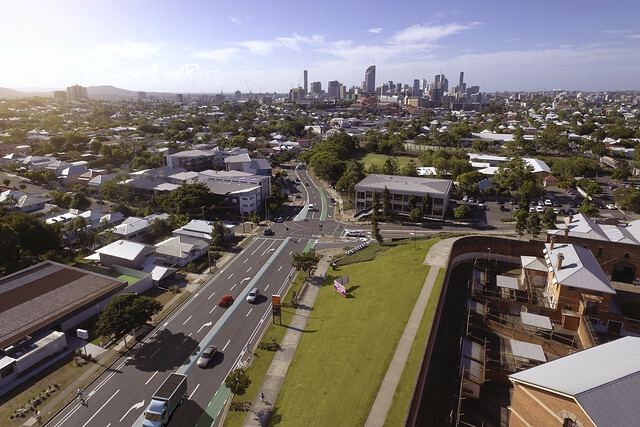 Brisbane City Council began construction of the Woolloongabba Bikeway project in November 2018. The project will be completed in late 2019, weather and construction conditions permitting. The bikeway will provide a safe corridor for cyclists travelling along Stanley Street and Annerley Road in both directions. Watch the fly-through video to learn about the project. An updated fly-through will be available in early 2019. Read supporting information for this video. To provide a safe corridor for cyclists travelling along Stanley Street and Annerley Road in both directions. This will provide a safer environment for all road users. The Woolloongabba Bikeway project is part of Council’s Better Bikeways 4 Brisbane program. It will create new lifestyle and leisure opportunities through dedicated bikeways and active travel options. Council has invested $100 million over four years from 2016-2020. 1.4 kilometres along Annerley Road between Stanley Street, Woolloongabba and Gladstone Road, Dutton Park. Council undertook consultation on the preliminary design in August-September 2017 and received valuable to feedback from the community. In response to community and Queensland Government feedback, Council made a number of changes to the design. Woolloongabba Bikeway project plan - detailed design 3 (Word - 868kb). The upcoming works in April 2019 will include standard construction hours between 7am and 5pm, Monday to Saturday. Continue footpath, drainage and bikeway works. Continue traffic signal works at signalised intersections. Continue profiling, asphalt layer and line marking works. Continue intersection works on Stanley Street at Allen Street and Merton Road, Trinity Lane, M3 on/off ramp and Leopard Street. Continue bikeway works on the Stanley Street service road at Gibbon Street, Hubert Street and Reid Street. Commence service utility works including installation of new drainage provisions. Continue road works for Dock Street slip lane. Commence car park and loading bay changes. Tuesday 23 April to Wednesday 24 April Service utility works, traffic signal/intersection works, asphalt layer and line markings. If works are required to be rescheduled Council will provide advance notification. no right-turn from Abingdon Street onto Annerley Road – access Annerley Road via School Road, left onto Ross Street and right onto Annerley Road. no right-turn from Grove Street onto Annerley Road – access Annerley Road via left onto Annerley Road, left into Crown Street, left into Stephens and right onto Annerley Road at the signalised intersection. no right-turn from Crown Street onto Annerley Road – access Annerley Road via left onto Stephens Road and right onto Annerley Road at the signalised intersection. no right-turn from Heaslop Street onto Annerley Road – access Annerley Road via right onto Merton Road, right onto Ross Street and right onto Annerley Road at the signalised intersection. no right-turn from Lockhart Street onto Annerley Road – access Annerley Road via right onto Merton Road, right onto Ross Street and right onto Annerley Road at the signalised intersection. Woolloongabba Bikeway project plan – Lockhart Street and Annerley Road changes (Word - 2.15Mb). no left-turn from Merton Road onto Stanley Street – access Stanley Street via left-turn onto Hawthorne Street, left-turn into Trinity Lane and left turn onto Stanley Street. Woolloongabba Bikeway project plan – Merton Road and Trinity Lane changes (PDF - 770kb). introduction of left-out only from Gloucester Street onto Annerley Road. access to Gloucester Street from Annerley Road will be available via Stephens Road. Woolloongabba Bikeway project plan – Gloucester Street and Annerley Road changes (PDF - 8Mb). Construction works began on Stanley Street and Annerley Road. It will progress in stages along both roads. Council has identified some tree removal is required. All work is carried out in accordance with the relevant environmental guidelines. Council will make every effort to minimise environmental impacts during construction. Vegetation impacts are offset in accordance with Council policies and relevant legislative requirements. Trees of various sizes to be replanted in the local area. Additionally, Council will remove a number of car parks, loading zones and taxi ranks to facilitate the project. temporary relocation of some bus stops. Council does not switch off reversing beepers due to workplace health and safety requirements. The Kangaroo Point Bikeway project will upgrade the Dock and Vulture Streets intersection connecting the Woolloongabba and Kangaroo Point Bikeways. This is part of the Woolloongabba Bikeway project. Council is also investigating additional measures to improve the operation of this intersection. As part of the final design for the Local Area Traffic Management (LATM) for the Merton Road/Catherine Street/Hawthorne Street Precinct at Woolloongabba, a pedestrian refuge will be installed on Hawthorne Street to improve pedestrian safety. This is being delivered as part of Council’s Woolloongabba Bikeway project. The Hawthorne Street pedestrian refuge was initially proposed in early 2018 as part of the LATM treatments. Initial consultation feedback received July 2018 indicated a lack of support for the pedestrian refuge as it would require removal of four car parks on Hawthorne Street. Subsequently, the pedestrian refuge was removed from the preliminary design. In late October 2018, subsequent feedback received from the local community demonstrated increased support to install the pedestrian refuge on Hawthorne Street. Therefore, Council has revisited the arrangement and reincorporated the refuge into the final design. Construction activities are expected to commence from late-March 2019 and take approximately four weeks to complete, weather and construction conditions permitting. Works times will be confirmed but are generally expected be undertaken between 9am and 2.30pm, Monday to Friday. Local residents and businesses in close proximity to the works may experience construction noise, dust and low levels of vibration and increased activity around the work site, including the presence of construction vehicles and equipment. Council is mindful of working in a residential area and will endeavour to minimise impacts to the local community as much as possible. Due to workplace health and safety requirements reversing beepers cannot be switched off. Every effort will be made to minimise disruption to the local community during this work. Hawthorne Street crossing - Local Area Traffic Management Woolloongabba (Word - 300kb). Council advises that two parking spaces on Merton Road will be altered to facilitate a loading zone near the intersection with Stanley Street. This loading zone will be located outside 10 Merton Road which currently contains two 4P parking spaces. To minimise parking impacts, the space will operate as a loading zone between 8am and 5:30pm Monday to Saturday and 8am – 12pm Sunday, when nearby businesses require a loading zone to facilitate daily business operations. Outside of these times when nearby businesses are closed, the space will be an unmetered 2P parking space for two vehicles. The loading zone will be implemented by late-March 2019 with appropriate line marking and signage installed to ensure road users are aware of these changes. Merton Road loading zone - Woolloongabba Bikeway (Word - 387kb). View the Woolloongabba Bikeway artist impressions photo gallery as a slideshow. Alternatively, view the photos individually in our Woolloongabba Bikeway album in Council’s Flickr account.